Hydraulic fracturing (informally known as hydrofracking, fracking, fracing, or hydrofracturing) is a process that typically involves injecting water, sand, and chemicals under high pressure into a bedrock formation via a well. This process is intended to create new fractures in the rock as well as increase the size, extent, and connectivity of existing fractures in order to extract trapped oil and gas. Hydraulic fracturing is a well-stimulation technique used commonly in low-permeability rocks like tight sandstone, shale, and some coal beds to increase oil and/or gas flow to a well from petroleum-bearing rock formations. A similar technique is used to create improved permeability in underground geothermal reservoirs. A form of hydraulic fracturing is also used in low permeability sediments and other tight subsurface formations to increase the efficiency of soil vapor extraction and other technologies used in remediating contaminated sites. Through an agreement among the Department of the Interior, the Department of Energy, and the Environmental Protection Agency, the USGS plays a large role in improving our scientific understanding of the environmental issues related to unconventional oil and gas. The scientific data provided by the USGS are crucial in helping Federal and State resource managers meet the challenge of balancing America’s needs for energy resources and a clean and healthy environment. 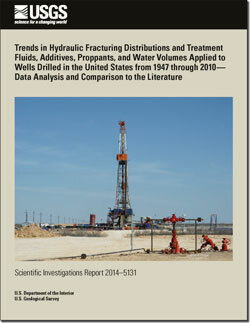 Here are examples of USGS publications that shed light on the facts about hydraulic fracturing. Entrekin, Sally; Trainor, Anne; Saiers, James; Patterson, Lauren; Maloney, Kelly O.; Fargione, Joseph; Kiesecker, Joseph M.; Baruch-Mordo, Sharon; Konschnik, Katherine E.; Wiseman, Hannah; Nicot, Jean-Philippe; Ryan, Joseph N.
Entrekin, S., A. Trainor, J. Saiers, L. Patterson, K. Maloney, J. Fargione, J. Kiesecker, S. Baruch-Mordo, K. Konschnik, H. Wiseman, J.-P. Nicot, and J. N. Ryan. 2018. Water Stress from High-Volume Hydraulic Fracturing Potentially Threatens Aquatic Biodiversity and Ecosystem Services in Arkansas, United States. Environmental Science & Technology 52:2349-2358. The Nation relies on oil and gas to power its economy, and unconventional gas is the fastest-growing energy resource in the United States. The U.S. Geological Survey is the authoritative, unbiased source for assessments of the world's oil and gas endowment. Come learn how these exciting new energy resources may contribute to the energy mix. The USGS newsroom distributes media alerts, press releases, and technical memos that highlight new and relevant research. Hydraulic fracturing is the process of injecting wells with water, sand, and chemicals at very high pressure to enable oil and natural gas production. These "unconventional" resources pose both opportunities and challenges. Join us to learn how USGS and its partners provide information so policy makers and resource managers can make decisions based on sound science. Below are frequently asked questions associated with the hydraulic fracturing (i.e. fracking).